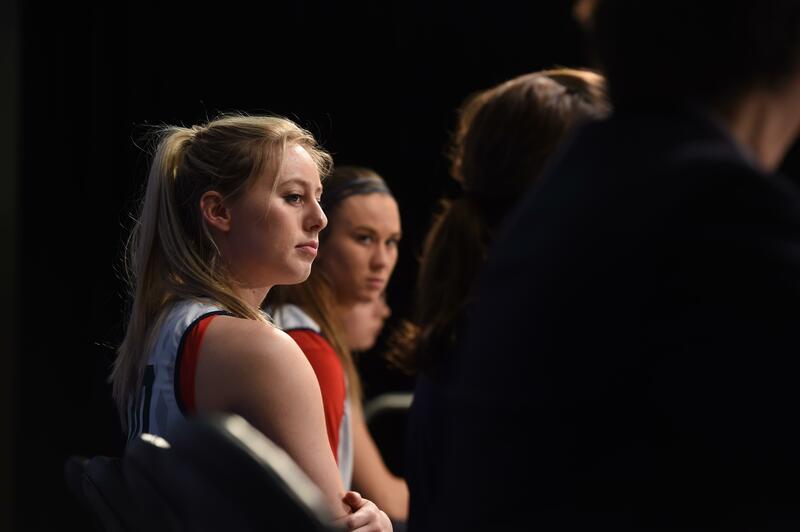 Sat., April 14, 2018, 5:24 p.m.
Chandler Smith, who led Gonzaga in minutes played last season as a redshirt junior, has been named to the Women’s Basketball Scholar Athlete Team by the DI-AAA Athletics Directors Association. One of 10 players on the 16th annual edition, Smith is the sixth Bulldog to receive the award and the fourth straight under coach Lisa Fortier. Smith, from Brewster, is pursuing her master’s in business administration after receiving her undergraduate degree in marketing. She has a 3.94 GPA and was previously honored this year as Academic All-District and All-West Coast Conference. A transfer from Nebraska after her freshman season, Smith was top three on the Bulldogs in five statistical categories – points (9.4, third), rebounds (5.7, second), assists (2.7, third), steals (1.9, first) and blocked shots (0.7, second). Scotty Sunitsch’s no-hitter for Washington State caught the attention of the nation. The senior left-hander from Federal Way, Washington, was named National Pitcher of the Week by the National Collegiate Baseball Writers Association, Perfect Game and College Sports Madness as well being the Pac-12 Conference Baseball Pitcher of the Week. Sunitsch needed only 95 pitches to blank the Oregon Ducks 7-0 in Eugene last Sunday, striking out a career-high nine. He walked two and hit one batter in the 25th no-hitter in WSU program history and the first nine-inning solo since 1976. Sunitsch pitched the final inning in a combined no-hitter last season that broke a 35-year program drought. • Whitworth athletes earned six awards in four sports, sweeping in softball and track and field, when the Northwest Conference named its athletes of the week. Freshman Madelyn Carlson from Enumclaw, Washington, was named Softball Pitcher of the Week for the fifth time this season and third in four weeks after allowing just two earned runs in 14 innings. Senior Michelle Silva from Aloha, Oregon, was Player of the Week after going 5 for 8 with six walks, driving in five runs, scoring five and stealing two bases. NCAA Division III javelin leader Andrew Bloom, a graduate student from Stanwood, Washington, was the Men’s Field Athlete of the Week after improving his season-best mark to 226 feet, 2 inches. Senior Kayla Leland (Gonzaga Prep) won women’s track honors after she broke the school record in the 10,000 meters at 35 minutes, 33.62 seconds, the best time in the NWC and fourth best in the nation. Emma Jo Wiley, a junior from Fort Collins, Colorado, went undefeated in four matches, helping the Pirates move closer to clinching a spot in the conference tournament, to gain women’s tennis acclaim. Keegan Loo, a sophomore from Hawaii, was the men’s golf choice after shooting back-to-back 1-under-par 71s to claim medalist honors in the NWC Spring Classic at Hangman Valley. • Logan Stahl, an Eastern Washington senior from Roseville, California, was the Big Sky Conference Men’s Track Athlete of the Week for winning the 800m in 1:51.55 at the WAR XI at Spokane Falls CC, a time that ranks second in the conference. • North Idaho freshman Madi Mott from Gladstone, Oregon, was named NWAC Softball Pitcher of the Week after throwing a four-inning no-hitter in a 9-0 win over Yakima Valley, striking out seven. Mott, 12-1 for the top-ranked Cardinals, is first in the NWAC in earned-run average (1.29), second in wins (12) and strikeouts (107), and fifth in batting average (.518). • Chelsea Li, a Community Colleges of Spokane sophomore from Richland, won her first three singles matches in league play after a strong showing against four-year opponents in the preseason and was selected the NWAC Women’s Tennis Player of the Week. • Josh Kallstrom collected his third Cascade Collegiate Conference Baseball Player of the Week award, and second straight, after the Oregon Tech junior first baseman from Ephrata led the Owls to their longest win streak of the season last week at four games. He leads the NAIA-West in batting average (.417), slugging percentage (.705), hits (65), doubles (19), stolen bases (10) and is tied for first in home runs (eight). • Weston Hatten, a transfer from Washington State and junior right-hander at Nevada, was the Mountain West Baseball Pitcher of the Week after he had a 1.54 ERA in 11 2/3 innings in two starts, striking out nine. • Ashley Brown, a Washington State sophomore setter from Prosper, Texas, who transferred from Oklahoma in January 2017, is one of 24 players chosen for the U.S. Women’s College National Volleyball Team-Detroit. Brown, the third Cougar selected to a U.S. Collegiate National Team, averaged 5.90 assists during the season, with a career-high 57 in WSU’s first-round NCAA Tournament win. Cougars teammates Taylor Mims and Alexis Dirige are members of the CNT-Europe team. CNT-Detroit is considered a second tryout for the U.S. Women’s National Team. Players will train and play exhibition games against each other in late June at the University of Michigan. • Shannon Casale, a defensive specialist who played as a redshirt freshman at Montana last season, announced she will transfer to Idaho in the fall and play volleyball for the Vandals. Casale, from Hamilton, Montana, started the first 18 matches at libero for Montana and played in 27 of the Grizzlies’ 29 matches. She averaged 3.14 digs in 93 sets, with double-digit digs in 14 matches. She led Montana in digs (292) and was second in assists (53). • Parker Bowden and Elizabeth Prouty, juniors on the track and field team, have been named the Eastern Washington Student-Athletes of the Month for March. Bowden, from Central Valley with a 4.0 grade-point average, placed 11th in the 110-meter hurdles at the Texas Relays with a time of 14.74 seconds, fifth best in the Big Sky this season, then won the event at the Whitworth Buc Scoring meet, to gain male honors. He set a school record in the 60m hurdles (8.0 seconds) in the Big Sky Indoor in February. Prouty, from Tigard, Oregon, the female choice, has a 3.56 GPA. After winning the Big Sky Indoor pole vault title in February at 13-3, she placed second at the Whitworth Buc Scoring Meet at 12-1 1/2 in March, tied for fifth in the Big Sky. • Thirty-two area athletes, 17 at Eastern Washington, were named to Big Sky Conference All-Academic teams for winter quarter in men’s and women’s basketball and men’s and women’s indoor track and field with GPAs of 3.20 or better. Three of the seniors were honored for a fourth straight year – women’s basketball players Mariah Cunningham (Central Valley) of Eastern and Delany Junkermier (Mead) of Montana State, and women’s indoor track and field athlete Selina Koon (Moses Lake) of EWU. EWU: Men’s basketball – Cody Benzel, junior, Ferris. Men’s indoor track and field – Isaac Barville, freshman, University; Parker Bowden, junior, CV; Jacob Christner, fr., North Central; Matthew Hommel, sr., CV; Isaac Kitzan, sr., NC; Dawson Lack, sophomore, Medical Lake; Domenic Rehm, jr., Medical Lake; Jackson Sloan, fr., University. Women’s indoor track and field – Leanne Asper, sr., Lake City; Kaelah Corrigan, so., NC; Kendra Hamm, sr., U-Hi; Gracie Ledwith, sr., Lewis and Clark; Isabella Millsap, fr., LC; Megan Murphy, sr., NC. Idaho: Women’s basketball – Allison Kirby, fr., Spirit Lake (Timberlake). Men’s indoor track and field – Josiah Anderson, so., Moscow (Logos); Mack Baxter, so., West Valley; Levi Wintz, jr., Moscow (Logos); Rikki McCaw, jr., Lake City; Robbie Van Idour, so., Lewiston. Women’s indoor track and field – Kara Story, so., Hayden (Coeur d’Alene HS); Jocie Osika, fr., Lake City; Cecilia Watkins, Jr., Lewiston. Idaho State: Women’s indoor track and field – Anna Gardom, so, Athol (Timberlake). Montana State: Men’s indoor track and field – Sam Bloom, jr., Ferris; Noah Martin, so, University. Women’s indoor track and field – Megan Ralstin, sr., Lewiston. • Gonzaga’s second varsity 8, which highlighted a four-race month by placing second in the Petite Final (eighth overall), at the prestigious San Diego Crew Classic and winning the Hornet Invite, was named West Coast Conference Crew of the Month for March. Crew members: Marie Hayman, coxswain, jr., Redmond, Wash.; Megan Seifert, sr., Concord, Massachusetts; Lindey English, jr., Seattle; Anise Potjes, fr., Costa Mesa, California; Genevieve Klein, fr., Portland; Megan Larson, fr., Issaquah; Alexandra Pinkley, jr., Lake Forest Park, Washington; Charlotte Lepp, so., Mercer Island, Wash.; and Georgia Davey, jr., San Francisco. Ty Smith, the Spokane Chiefs’ two-time Scholastic Player of the Year, has been named the Western Hockey League Western Conference Scholastic Player of the Year. Since arriving in Spokane from his home in Lloydminster, Alberta, for the 2016-17 school year, the 18-year-old defenseman “truly epitomizes what it means to be a learner,” said Chiefs education adviser Joe Everson. Smith has maintained a 3.57 GPA during his two years in high school here, posting a 98 percent in computer applications, 95 percent in anatomy and physiology and 91 percent in physics. He’s also registered 88 percent in precalculus, 87 percent in English, 84 percent in bridge-to-college English and 83 percent in AP statistics. Smith and Eastern Conference scholastic recipient Chase Wouters of Saskatoon are finalists for the Daryl K. (Doc) Seaman Memorial Trophy as WHL Scholastic Player of the Year. It will be awarded at the 2018 WHL Awards banquet in Red Deer, Alberta, May 2. Two former Chiefs have been Seaman recipients, Reid Gow in 2012 and Kyle Rossiter in 1998, with Rossiter going on to be named CHL Scholastic Player of the Year. • Chiefs forward and Los Angeles Kings prospect Jaret Anderson-Dolan was assigned on loan by the Kings to their Ontario (California) Reign affiliate in the American Hockey League after the Chiefs’ season ended in the first round of the WHL playoffs. Anderson-Dolan, 18, a second-round selection of the Kings in the 2017 NHL entry draft, just completed his third WHL season, posting career and team highs of 40 goals and 91 points. The Reign are second in the AHL’s Pacific Division and Anderson-Dolan gives them depth at forward for the AHL playoffs that begin this week. He had two assists in his first three games last week. • Former Spokane head coach Bill Peters, who guided the Chiefs to the Memorial Cup in 2008, has been named head coach of the Canadian team for the 2018 IIHF World Championships May 4-20 in Denmark. Peters, an assistant with the Chiefs for six seasons starting in 1996 and head coach from 2005 through the WHL and Memorial Cup championship season, has been head coach of the Carolina Hurricanes in the NHL for four seasons. • Spokane native and former Chief Tyler Johnson, in his sixth season with the Tama Bay Lightning in the NHL, has been featured on The Players’ Tribune, a new media platform founded by former MLB star Derek Jeter. Johnson’s post, titled “Another Chance,” details his path to the NHL, including a phone call he got from Hall of Famer Steve Yzerman that sold him on the Lightning. Montana volleyball – Kelsey Nestegard, OH, Pullman, first-team All-State 2A, two-time All-GNL first team. Washington State women’s tennis – Hikaru Sato, Tokyo. Jovana Knezevic, Limassol, Cyprus, transfer from University of Pittsburgh. Published: April 14, 2018, 5:24 p.m.